Cheapest Wood Burner Installations in Somerset. Hetas wood stove fitters. We offer the cheapest wood burner installations in Somerset and Devon. Show us your quote from a professional Hetas installer and we will beat it. They must be Hetas registered and all supplied parts must carry the CE mark. We will not use cheap quality components however. Glowing Stoves will price match like for like. That is all we ask. We guarantee to be cheaper! Example of our claim to offer the cheapest wood burner installations. Based on a 5KW stove supplied by you. 316 stainless steel liner up to 10 metres length. Chimney cowl stainless steel or terracotta. Adapter to connect Flue pipe to liner. Data plate filled in and fitted. Complete Wood burning Stove Installation. CE marked carbon monoxide alarm. For all of the above we will only charge £875! Nobody can touch our prices. 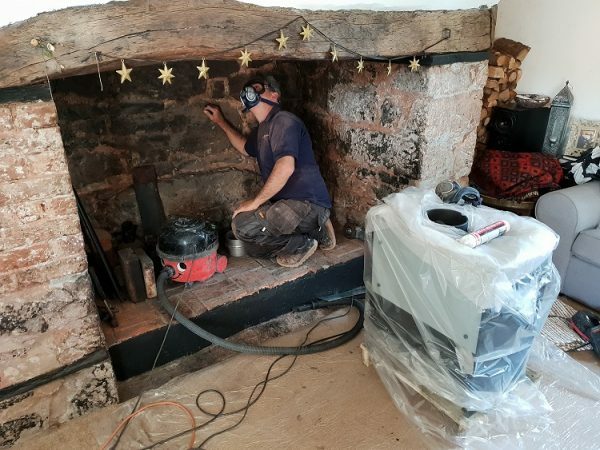 How can we offer the cheapest wood burner installations in Somerset? We can offer the cheapest wood burner installations purely and simply by working hard. Correspondingly from the moment we get to the job we stay focused despite the challenge ahead. Furthermore our experience guides us. We go on auto pilot and work with a system. Also this system is tried and tested and makes us very efficient with our time. Accordingly, this makes us certainly altogether better value. Despite our competitive pricing we focus above all, on a quality stove installation. So in conclusion, we offer the cheapest wood burner installations coupled with a focus on quality. Another key point is our aftercare. In due time a service may be required. Ask us about our yearly servicing packages which are surprisingly good value. Call Glowing Stoves for a FREE survey. We offer FREE quotations and surveys on all Log burner installations in 2019. Furthermore we will advise you on the best solution. For the cheapest wood burner installations call us now.